The original launch of the XE promised so much, didn’t it? This was Jaguar turning a corner. This was the start of the company’s new age. The first of many bang-up-to-date new products that proved, once and for all, that the British firm could go head-to-head with a certain trio of German companies. But it didn’t really work out like that. 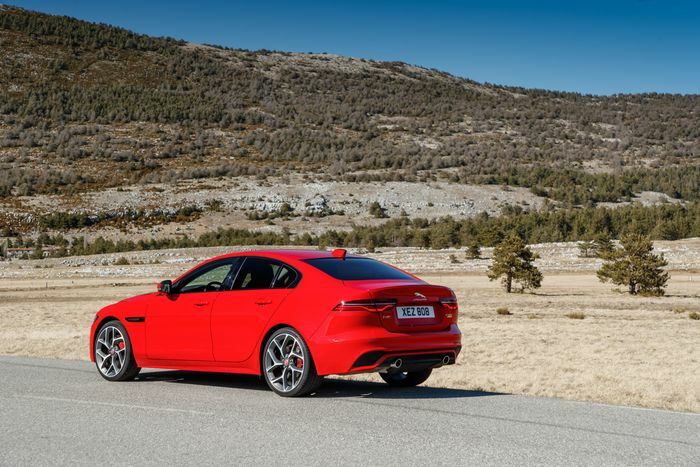 As the world turns away from saloon cars, the XE and XF haven’t proven to be all that popular. JLR bet big on its new Ingenium diesel engines, only for VW’s emissions-fixing scandal to sully the fuel’s reputation, potentially for good. Chuck Brexit uncertainty into the mix, and you have the perfect storm of financial woe the big cat currently finds itself in. The XE itself didn’t quite pan out as hoped either. Sure, it drove beautifully, looked lovely in the right spec, and the V6-powered S was an overlooked sports saloon gem that kicked out one hell of a soundtrack. But on the build quality and tech front, it didn’t do enough to fend off the BMW 3-series, Mercedes C-Class and Audi A4. This, it seems, wasn’t lost on Jaguar. For the new, facelifted version, a great deal is being made about the interior changes. Justifiably so - it’s massively different in there now. 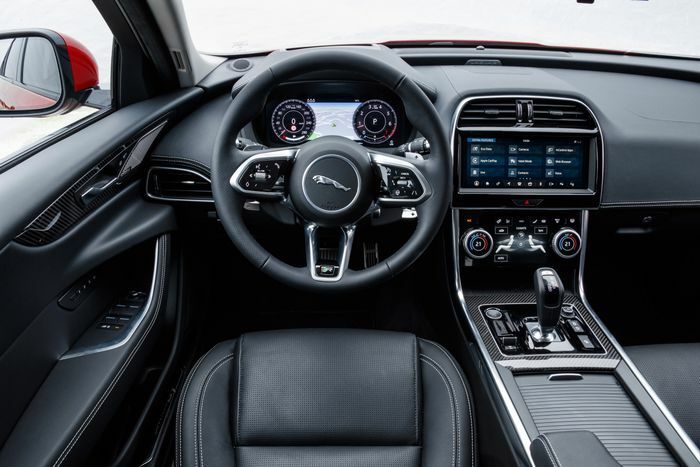 There’s a fancy digital instrument cluster, a rather brilliant dual screen infotainment system pinched from the I-Pace (which is optional on all but HSE cars, but worth having), along with the electric Jag’s steering wheel. Probably the best bit is the surprisingly substantial wheel-mounted ‘satin chrome’ gearshift paddles - they’re beautiful and thoroughly lovely to use. Most of the bits that cheapened the old cabin are gone, and having also driven the new F-Pace SVR - which has largely the same dash setup of the old XE - on the same event, the difference is rather stark. It’s just a little awkward that Audi’s near-five-year-old Virtual Cockpit system walks all over Jaguar’s entry to the digi-dash genre. What you can do in a matter of seconds with the Audi system takes what feels like an eternity in the Jaguar. 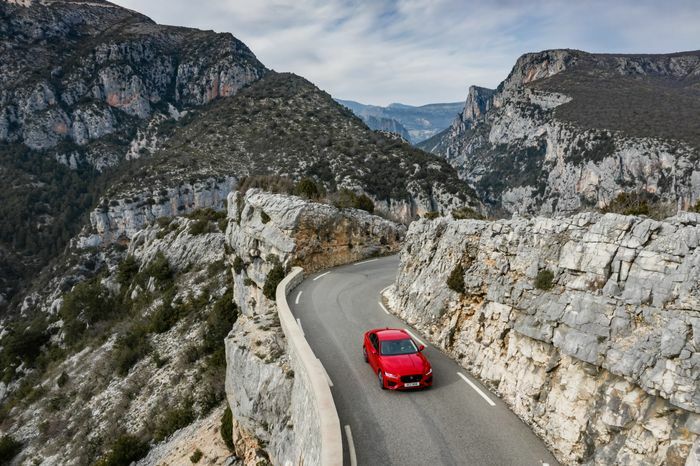 Once you stop fiddling and start driving, you find that the XE is as impressive on the move as it ever was. The ride is the stand-out feature of this car. Even on the giant 20-inch ‘Propellor wheels - something designer Ian Callum and his team lobbied hard to keep on the options menu post-facelift - the baby Jag glides along beautifully. The chassis hasn’t really been touched, but the major difference to the car’s waftability lies in the NVH improvements - it’s a quiet, relaxing car to drive. It’s not a one-trick pony, however - whack it in Dynamic mode and poke it with a stick, and you’re in for a good time. The damping is fantastically resolved, giving commendable body control and a perfectly acceptable amount of lean for a car like this. 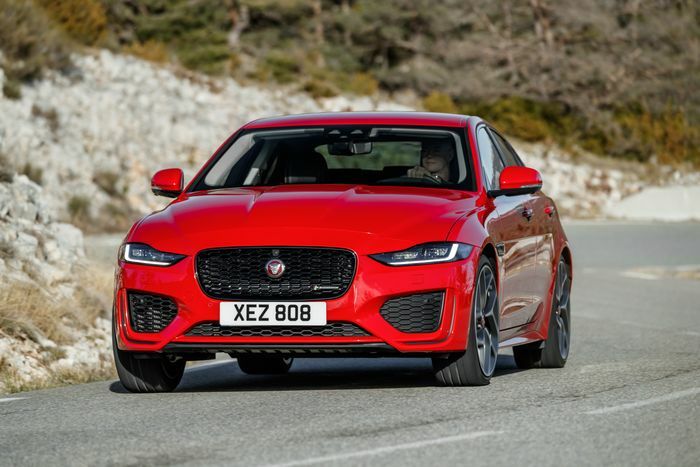 Jaguar hasn’t gone mad and made its smallest four-door car a mega-stiff, pretend super saloon - this is all about the balance between comfort and sportiness, which it nails. There’s not a great deal of feedback from the steering, which is par for the course these days, and in any case, you don’t care as the weight and the speed are very well judged. Meanwhile, traction levels from the all-wheel drive system are high enough to remain untroubled by either versions of the 2.0-litre inline-four petrol. The rear-drive version is hardly a tail-happy maniac though, and is just a little more engaging, so that’s what we’d go for. Is it a shame there’s no V6? Sure, although it’s hard to ignore the fact that no one bought it. The 296bhp ‘P300’ range-topper is nicely brisk rather than properly fast, and sounds inoffensive enough. The 247bhp ‘P250’ feels barely any slower, perhaps down to the lack of the AWD gubbins of the car we tested. It’s also the only rear-drive petrol you’ll be able to have in the UK, with the range now significantly simplified. The only other engine on the menu is a 188bhp diesel, which we’ve yet to try. A lack of sparkle in the powertrain department is something I can live with, but the automatic gearbox? That I take issue with. It’s the usual eight-speed ZF transmission that’s in everything now, but whatever Jaguar has done with the software, it’s not worked. It’s super quick to change up or down when you take matters into your own hands, but left its own devices? It’s not so good. It takes an age to respond to changes in throttle pressure, and during more boisterous driving, it doesn’t hold onto gears like it should. It’s not good enough considering what BMW can do with the exact same gearbox in the 3-series. Speaking of, the XE still isn’t quite good enough to truly worry the BMW. Or the equivalent Merc or Audi, for that matter. But has the gap been closed? Hell yes, and considerably so. As a left field alternative it’s much more convincing than the Alfa Romeo Giulia. 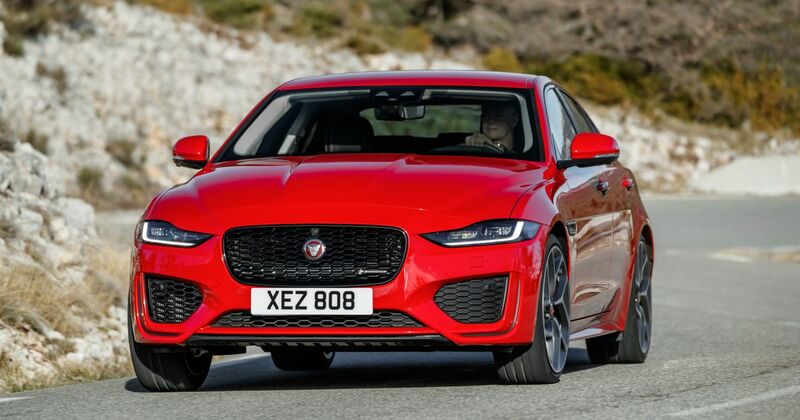 It’s also handsome in an unfussy, understated way, looking nicely fresh with its styling tweaks, and Jaguar has even made it a little cheaper while giving you more stuff on the standard kit list. 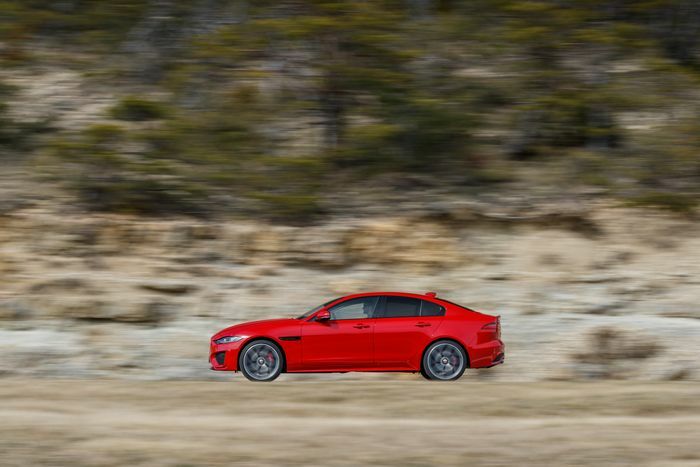 You still have to truly want to be different before considering an XE, but the case for this car is now stronger than ever. Features BMW M850i Review: Do We Even Need An M8? Features Mercedes-AMG A35 Review: A True AMG Or A Poor Relation?